​A sub-unit fighting against Isis in Syria made up of LGBT individuals which makes “smashing the gender binary and advancing the women’s revolution as well as the broader gender and sexual revolution,” has been kicked out of the frontline fight for Raqqa, several reports have said. 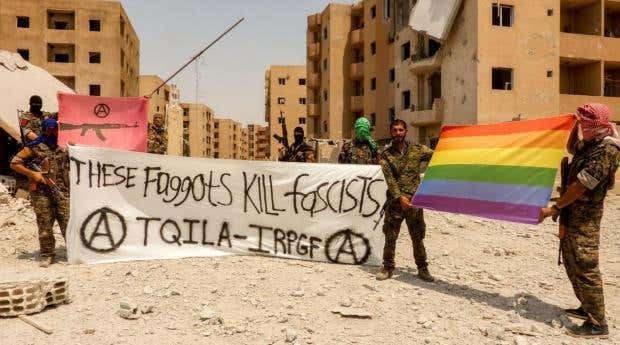 ‘TQILA’, as it is known, made headlines after its formation was announced last month by the anarchist International Revolutionary People’s Guerrilla Forces (IRPGF), a small offshoot fighting force in Syria made up of foreigners. Initially it appeared that TQILA and the IRPGF were working with the Kurdish People’s Protection Units (YPG) and Arab-Kurdish coalition Syrian Democratic Forces (SDF). The mainly-Kurdish militias in the north of the country have won significant US support for proving themselves the most effective ground force against Isis since the militants rose to prominence in 2014. However, as word spread of TQILA’s formation, requests for comment were met with denials from the SDF that the group is affiliated with their fighters, or exists at all. While the new unit was praised by some as a positive response to the systematic persecution of gay individuals by Isis, it was also met with criticism for what many saw as a tone-deaf announcement by foreigners which could inflame tensions with more conservative militias fighting for the same cause. TQILA told The Independent that its members counted themselves as “Middle Eastern queers” which come from a range of countries, as well as the Middle East’s ethnic groups. It is not clear how many they number – by some accounts, fewer than 20. Social media posts and inquiries made by The Independent to people in the region indicated that TQILA had members both training in the city of Rojava and involved in the fight to reclaim Isis’ de facto capital of Raqqa, which began in earnest in June. “IRPGF yesterday got kicked out of Raqqa, hopefully soon from Rojava – we need less empty propaganda, more fighting”. The tweet has since been deleted. SDF, IRPGF and TQILA representatives did not immediately respond to requests for comment. YPG fighters have previously been critical of the IRPGF’s efforts in the fight against Isis. An official Twitter accounts said they are “three crazies” with which they refused to form an alliance with.